My reading has been pretty slow this past week so most of the updates below are for children’s books this week. I’m still reading The Time Traveler’s Wife by Audrey Niffenegger. I’m tree quarters of the way in and I’m really enjoying it. I so want to know how it ends, even though I know I’ll miss the characters when the book is over. Since I’m still reading the same book, I have no updates for this section. 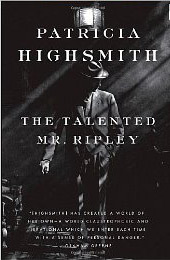 Oh, The Talented Mr Ripley by Patricia Highsmith just showed up at my library! This will definitely be my next book. I’ve wanted to see the movie for many years but the book should come first, as always. 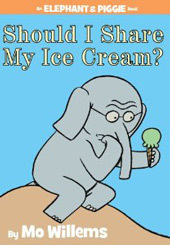 The brand new “Should I Share My Ice Cream?” by Mo Willems and they love it! OK, I do too. The story is hilarious, sweet and agonizing. And it illustrates my husband’s worst nightmare about ice cream cones, so it’s a plus. I recommend this book to all kids between 3 and 6. We’re also reading the new Rob Scotton book, “Splish, Splash, Splat!”. My kids have been taking swim lessons for several weeks so this book is a perfect companion to help them conquer any fear of water they may have. If a cat manages to like water, so should they! We recently revisited a storytime favorite, “Interrupting Chicken” by David Ezra Stein. If your little ones interrupt you during storytime, this is the book for you. Lovely painted illustrations and a laugh-out-aloud storyline will help kids understand why interrupting the reader can be frustrating. We’ve borrowed a number of Lisa Wheeler books and are starting to make a dent into the pile. Wheeler likes to write in rhymes and she’s quite talented at it. I’ll comment on her books next week after we have a chance to read a few.